Genesis Contra: Hard Corps (unknown) in 15:50.7 by Gigafrost. Browny (the robot) is used in this video because of his Yo-Yo weapon, which has huge damage but short range. 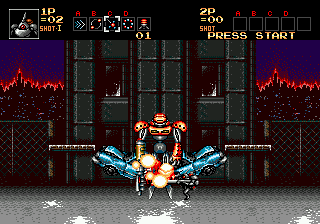 For example, the first boss is killed so quickly with it, that he never enters his second attack mode.